Jacques Pauw's book, The President's Keepers. South Africa's NB Publishers has been shortlisted for the International Publishers Association (IPA) Prix Voltaire for 2019, which acknowledges "exemplary courage" in upholding the freedom to publish, the company announced on Tuesday. The award also valorises enabling others to exercise their right to freedom of expression. Others on the shortlist are Khaled Lutfi, an Egyptian bookshop owner and publisher who was imprisoned for allegedly disclosing military secrets for distributing the Arabic version of the book about Ashraf Marwan, who is said to have spied for Israel in the years leading up to the October 1973 Arab-Israeli War. Egypt has denied he was a spy. The book, by Israeli author Uri Bar-Joseph, was published in English as The Angel: The Egyptian Spy Who Saved Israel, according to the website Al-Fanar Media. Iranian Azadeh Parsapour, who is now based in London, is managing editor of Nogaam e-Publishing that uses crowdfunding to publish Iranian censored authors. Tekin Publishing House in Turkey aims for cultural enlightenment and books on a variety of subjects for people who question things, according to its website, and Moe Way, who runs The Eras, a printing press in Myanmar. 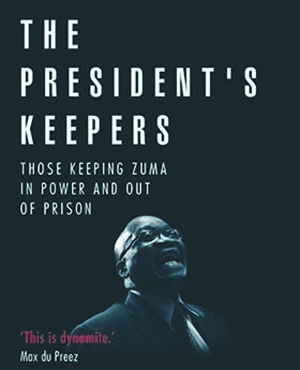 The President’s Keepers, by Jacques Pauw even led to Pauw's home being searched. "The book was published amid intimidation and harassment of both the author and publishing house (with a risk of jail and physical harm), including from the State Security Agency and the South African Revenue Service – both targeted by the book," said the company, which is part of the Media24 stable. When calling for nominees, the IPA said: "In many countries, publishers who provide authors with the means to disseminate their written ideas run the same risks as the writers themselves. "Their work requires immense courage and a values-based, altruistic compulsion. The Freedom to Publish is far from guaranteed around the world, with daily attempts by governments, extremists or private interests to intimidate, attack, imprison and even kill publishers." NB Publishers noted that the nine-strong body of publishing professionals from Argentina, Australia, Egypt, Germany, Italy, Norway, Republic of Korea, Thailand, and the United States felt the nominees deserved to go through to this year’s shortlist. The IPA’s Freedom to Publish Committee will present the award at the Seoul International Book Fair on Friday, June 21. The nomination comes as former News24 writer Pieter-Louis Myburgh's launch of Gangster State was disrupted by critics in Hyde Park two weeks ago. The publisher, Penguin Random House, says it stands by its author.